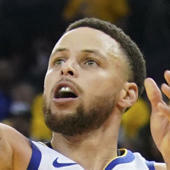 There was no shortage of NBA action on Friday night, as seven games populated the league's schedule, highlighted by a rematch between two teams that played earlier this week when the Toronto Raptors hosted the Oklahoma City Thunder. The Raptors defeated the Thunder on Wednesday in Oklahoma City, but Paul George, Russell Westbrook, and Co. made sure there wasn't a repeat performance as they picked up the tough road win. Elsewhere, two of the NBA's hottest teams -- and two teams that are in the thick of the playoff picture in the NBA's Western Conference -- went head-to-head on Friday night when the Houston Rockets hosted the San Antonio Spurs. The night was owned by James Harden, who tied his own Rockets scoring record with 61 points in the win. Lastly, the Los Angeles Lakers were officially eliminated from the playoffs at the hands of the Brooklyn Nets. LeBron James had 25 points and 14 assists in the loss, but the real star was JaVale McGee, who put up a monster line of 33 points, 20 rebounds and six blocks. It was a foregone conclusion, but the Lakers were officially eliminated from playoff contention with Friday's loss the Nets. It's the first time LeBron James will miss the postseason since 2005. James Harden wasn't messing around on Friday night. Not only did he set a Spurs opponent record by scoring 37 points in the first half, but he also finished the game with 61 points, tying his own Rockets scoring record. Harden also joined Michael Jordan, Kobe Bryant and Wilt Chamberlain as the only players to score 60 or more points multiple times in an NBA season. Hmm, where have we seen this before? Lakers superstar LeBron James may have his minutes limited toward the end of the year, but the 34-year-old still has a lot left in the tank. He proved it with one of his patented chase-down blocks against D'Angelo Russell and the Brooklyn Nets. Yes, you read that right. We all know that James Harden is amazing, but he managed to outscore the Spurs all by himself in the first quarter: 27 to 24. The 27 points were Harden's career-high for any quarter and three short of a Rockets franchise record for a single quarter. Knicks rookie Mitchell Robinson is no stranger to the highlight reel. He got it done on both ends on Friday with a block and an impressive finish at the rim. The Magic almost lost a crucial game to an under-manned Grizzlies squad, but Terrence Ross helped them fight back for the overtime win. Ross scored 31 points and pulled down seven rebounds off the bench.